Cold-pressed juice is the latest fad among the country's health-conscious lot. Is it worth it? PROVIDING INNOVATIVE solutions to help people keep up with today’s fast-paced, health-conscious lifestyle is turning out to be a lucrative business. The latest in line is cold-pressed juice that has grabbed the attention of a niche group of upscale consumers. The juice, dubbed raw and fresh, is extracted by a technique, traditionally used to prepare cooking oil. Unlike the conventional juicer with metal blades that spin against a mesh filter, separating juice from pulp by centrifugal force, cold-pressed juicer simply presses the fruit or vegetable. The process does not involve much heat, and hence the name, cold-pressing. The juice has been well-known in the US for quite some time. In the early 1930s, Norman W Walker, an English-American businessman who advocated the importance of raw fruit and vegetable juice, designed a hydraulic press to extract the last drop of juice from fruits and vegetables. The trend, however, captured the imagination of juice aficionados only in the last couple of years, with American coffee company Starbucks launching its own line, Blue Print Juices. 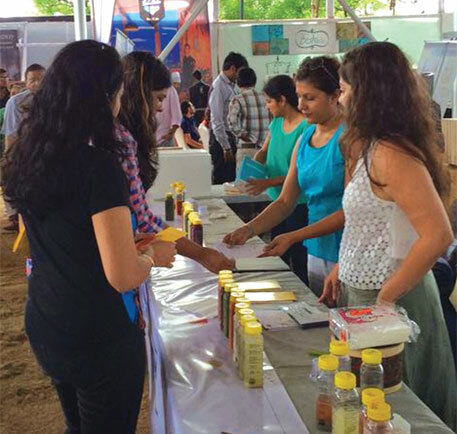 In the past six months, two cold-pressed juice manufacturing units have been set up in India—Antidote in Gurgaon and Raw Pressery in Mumbai. The companies produce a range of cold-pressed juices that promise a healthy life. 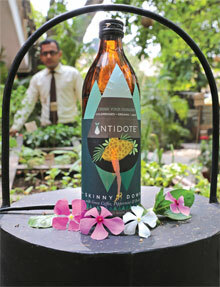 Antidote produces five “cleanses”, as it refers to its products—green coffee and peppermint juice for alleviating hunger pangs; mangosteen, Himalayan berry and noni (also known as Indian mulberry) juice for imparting glow to the skin; and wheatgrass and courgette juice for detoxification of the body. Its one-day cleansing package consists of four types of juices, each measuring 240 ml, and costs Rs 950. Raw Pressery provides six juice recipes. The ingredients for the juice that helps in weight management include kale, spinach, bottle gourd, cucumber, Indian gooseberry, celery, green apple and lemon, while a blend of bell pepper, tomato, carrot, celery, ginger and lemon provides the much needed dose of antioxidants. It costs Rs 1,500 per package. Despite such exorbitant rates, the companies claim to have received overwhelming response to their products. One such customer of Antidote is 46-year-old RenuTaararamya. She suffers from fibromyalgia, a nervous disorder that makes her body clench every now and then. “I was dependent on steroid-based medicines, which have side-effects,” Taararamya told Down To Earth. In March I came across an advertisement of Antidote and ordered its detox juice on trial basis. Now, I am a big fan of cold-pressed juice,” Taararamya says, adding that she does not take medicines anymore. Unlike packaged and other kinds of freshly made juice, cold-pressed juice is packed with all the nutrients and live enzymes present in fruits and vegetables, says Simran Singh, a nutritionist who launched Antidote in November last year. It is free from preservatives and additives present in packaged juice. The problem with centrifugal juicer is its fast-spinning blades generate heat and destroy some of the health giving “live enzymes” and nutrients, says Singh who runs Antidote with her daughters, model and writer Carol Singh and Nadia Singh Bahl, who specialises in marketing management. Juices lose vitamins even while sterilising them in Tetra packs, says Jyothirmayi, secretary of Association of Food Scientists and Technologists, Hyderabad chapter. Since cold-pressing avoids drawing air into juice, the product can be stored for at least four days without sterilisation or preservation. To top it all, Carol says, her company uses only organic produce from selected vendors. Raw Pressery also claims to procure raw material from farmers who do not use chemicals. Both companies have nutrionists on board who guide them to prepare different juices as per the needs of customers. To cater to their expanding client base, Antidote has delivery points at the posh Lodhi Road, MalchaMarg and Chanakya- puri of Delhi and home-delivers in Gurgaon. “We receive 15-20 new orders every day,” says Carol Singh. Raw Pressery uses the network of dabbawallas. “We have reached out to over 2,000 customers in just four months and have expanded the business to Pune. Our next targets are Delhi and Bengaluru,” says 34-year-old Anuj Rakyan, who quit his jewellery business to start the company. Though there is growing eagerness for cold-pressed juice, it may not become a household name. “The juices are all good but pretty expensive. I hope that its price will come down,” writes one SnehaArekar on the Facebook wall of Raw Pressery. Rakyan says the cost is not high given the efforts that goes into ensuring purity of the product. Besides, commercial cold-pressed juicers are highly expensive. While both companies refused to divulge the cost of their equipment, a cold-press juicer for domestic use costs upwards of Rs 25,000. Many nutritionists say juice is not wholesome form of nutrition. Rekha Sharma, former chief dietician of All India Institute of Medical Sciences (AIIMS) in Delhi, says eating whole fruits and vegetables are better than any kind of juice. Imtiaz Khan, a street vendor in Jungpura, Delhi, charges Rs 20 for a glass of juice he extracts using masticating juicer. The machine is similar to cold-pressed juicer but produces more pulp. Khan claims that his juice is fresh and authentic as he extracts it right then and there, in front of consumers. Do his claims call for attention of juice aficionados? Masticating juicers are truly the best juicers out there but they are hard to clean and not suitable for home use. The juice has to be clarified of all fibre to be packed. Cold pressed juices are still chock full of nutrition and fructose is any day better than sucrose. So if customers are willing to forgo food and drink the juice, it IS a cleanse, it is good for a human body no matter which angle you approach it from. It is better if you head out there and drink a glass of mixed juice instead of food every day. But if you can't, even these juices are good enough aren't they? After all its not often that you get organic super foods as juices on the street.